Prominent is in a class of its own. The typical native Australian greenery stands tall and proud, begging to be noticed and admired, beautifully surrounded by flora that is also of native Australian origin. 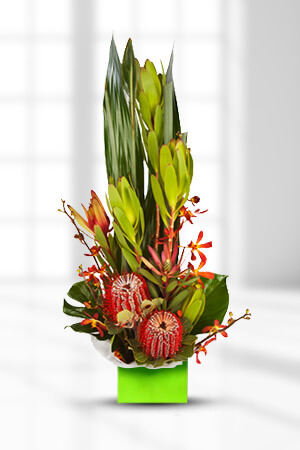 Send Prominent to the loved ones in your life who enjoy an arrangement with Australian nature at its best.Add to the pleasure of sending flowers, not to mention receiving them, by sending a bottle Red along with your flower arrangement. It was a re-order and the process could not have been any easier. Thank you so much. It was a great service, a quick sending and wonderful flowers. My son and his wife loved them. A very nice greeting to Christmas from Germany to Australia! Always again with pleasure! Thank you very much. We had a very good service, a quick sending and wonderful flowers. My son and his wife loved them. It was a great greeting for Christmas from Germany to Australia! easy to order delivered on time and the recipient was estatic about arrangement.